Upgrade to a new compiler while everyone else works on the old one. Branching would have simplified the contention developers from different parts of the company faced. To get technical, in mercurial anytime two changesets are committed against a common parent, a branch is created. A simple illustration shows how this works. L:\illustration>hg commit -A -m "root"
L:\illustration>hg commit -m "branch a"
Back up to a parent changeset. Remember, branches are created by making multiple commits to a given changeset. L:\illustration>hg commit -m "branch b"
Nothing comes free in life, and branching does have its problems. There is some complexity tracking which changes are where and eventually, those parallel universes have to be merged back together. There is a trade off between complexity and code safety. No branches avoids all the complexity, but gives us none of the benefits. Thousands of branches buries the benefits in the overhead of tracking and maintaining them. At some point in the middle, there is a sweet spot where branches protect the source code, but are not too much hassle the work with. L:\illustration\client>hg commit -A -m "more work"
L:\illustration\client2>hg commit -m "other guys work"
Using this method, your changelog will start to get a lot of these loops in it. A couple times doing this and it gets frustrating. I've heard some of this frustration and sympathize with you. Frustration naturally begets shortcuts like not compiling a merge or testing completely. Let us look at an easier alternative using branches. Here we use a model were our changes stay on a branch until we are done with them. 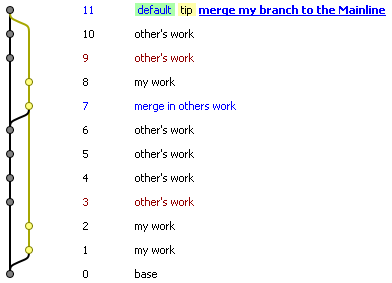 To ease merging at the end of what could be a long running branch, we ocasionaly do a reverse merge, pulling others changes into our branch. When we are done, we merge our changes into the mainline. We want to create a branch, so go ahead and force a push that creates multiple heads. Now, we do some more work uninteruppted by others changes. However, we can't ignore others changes completely. Every change you and the other guys make is diverging the two branches. You could wait until the end of your efforts to merge the other guys changes in, but that would probably be really hard. To make it easier, ocassionally pull in others changes to your branch. Eventually, you have finished with this branch and are ready to merge it back to the mainline. 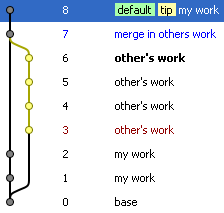 Switch to the mainline and merge the branch into it.